Mix chili powder and allspice together in a small bowl; set aside. In separate bowl, combine tomatillo salsa, wasabi paste and corn; set aside. Rinse any ice glaze from frozen Alaska Sole under cold water; pat dry with paper towel. Heat a heavy nonstick skillet over medium-high heat. Brush both sides of sole with oil. Place fillets in heated skillet and cook, uncovered, about 3 to 4 minutes, until browned. Shake pan occasionally to keep fish from sticking. Turn fillets over and season with chili powder and allspice. Cover pan tightly and reduce heat to medium. Cook an additional 4 to 6 minutes for frozen sole or 2 to 4 minutes for fresh/thawed fish. Cook just until fish is opaque throughout. Divide fish among tortillas. 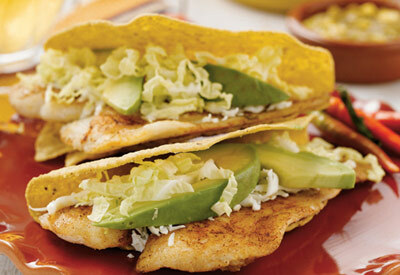 Top with 2 tablespoons cheese, 2 avocado slices, 1/4 cup cabbage and 3 tablespoons salsa mixture.